Welcome to Erika Reade—i need this wreath! This week we are focusing on Christmas shopping to help all of you wonderful followers find the perfect gift for everyone on your ever changing Christmas list. Today I am taking you to one of my favorite stores in Atlanta—Erika Reade. 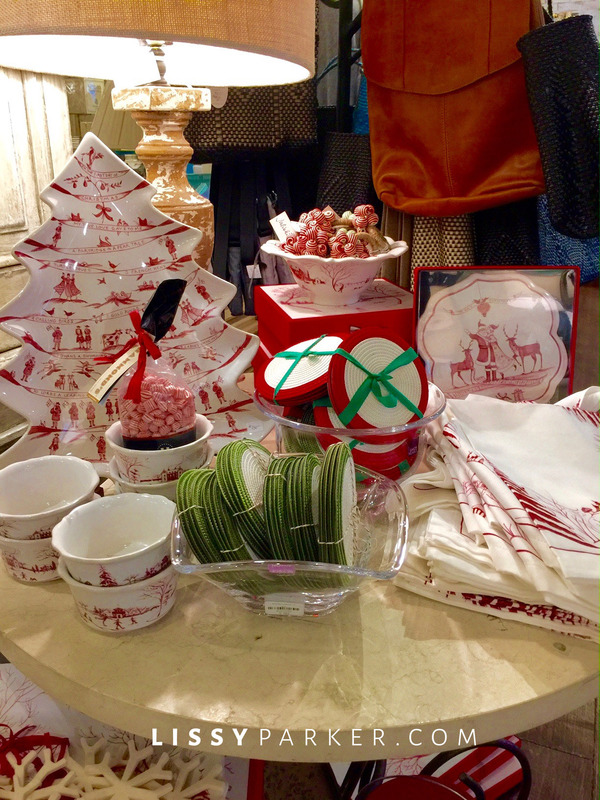 They carry almost anything you could possibly need for your Holiday gifting, table setting, wardrobe, decorating or travel. They also supply gifts for Santa to deliver to your little ones—how special is that? Drop the little darlings off at school and head on over to Erika’s. Complete your shopping list and maybe a little retail therapy too! The mugs are in these cute boxes near Santa. How great would these napkins be on your Christmas morning table. This Christmas china by pottery artist Cabell Sweeney from Rome, Georgia is only available one time a year! I am partial to these colorful bowls. This sweet Christmas tree bowl would make a very special gift. They have a beautiful selection of ornaments—I buy one every year for my son. Snowy white and silver from Simon Pearce adorns this holiday table. Gift idea—a bed full of monkeys if you don’t already have little monkeys. A little one I know is getting one of these colorful cars. How to be a Dog is on every boy’s list. Add a little Christmas red to the beds with red quilts. This tray is fun and sooo true! There are paintings for your home. Bath salts, soaps, lotions and scents would make a great gift for an at home Spa. More is always more for the at home Spa. Gowns and robes for Christmas are always a great idea for the girls on your list. The Barefoot Contessa’s new book is on everyone’s list.